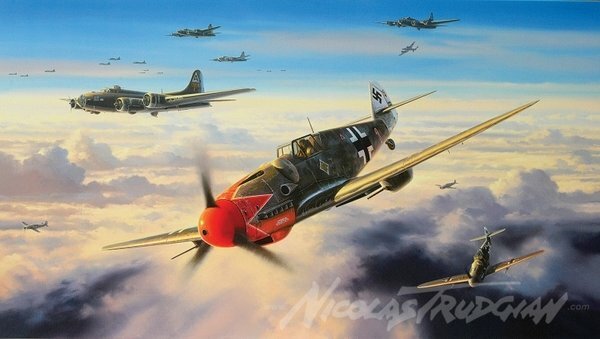 Possibly the most vividly coloured Me109 of WWII, Bf109G-6 'Red1' of Major Hermann Graf, Gruppenkommandeur of JG(r)50, swoops through a formation of Flying Fortresses over western Germany in September 1943. The only opportunity to obtain the full-size canvas reproduction of this painting, individually signed and numbered in paint by the artist. Size when stretched: 36" x 20".